At Greenleaf, we are licensed and experienced in all aspects of pest control, from getting rid of ants, roaches and termites, to larger problems such as rodents and pigeons. We also have training in the Africanized "Killer Bees" and ornamental pest control for flowers, shrubs and trees. The difference is that we specialize in a method of pest control where we look at the total picture of how and why you are having a pest problem. This method is called Integrated Pest Management (IPM). If a pesticide is needed to help resolve the problem, we opt for a low-impact product to take care of it. Our certified pest control experts average 15 years experience and are professionally trained to treat the most vulnerable areas and to get to the source of pest problems with natural pest control methods. 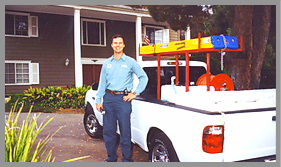 We help people keep a safe home by providing our pest control services, avoid costly damage to homes by eliminating their termite infestations. All this, while enjoying a more comfortable home in both summer and winter. We also take pride in helping the environment and doing our part towards energy conservation and making the planet a greener place for generations to come.